Rome – Leaders of the radical opposition group, We Are Church International (WACI) have expressed serious concerns about the expansion of the Vatican Dicastery for Laity, calling them “ineffective” after they failed to include deepened reflections on the role of women within the Church. This reaction was prompted after new statutes issued by Pope Francis took effect on 13 May. Holmes continued, “We Are Church International calls on Pope Francis to establish a Dicastery for Women’s Equality. As former Irish President Mary McAleese pointed out in her remarkable address on International Women’s Day earlier this year, the Catholic Church needs to stop spreading the virus of misogyny and inequality throughout the world. A separate dicastery with a clear mission of dismantling the structures of oppression that result from Church teachings and practices is a necessary first step. WACI has been promoting women’s equality in the Church for a long time now. The organisation supports all efforts to open up ministry and decision-making roles to female counterparts, but sees the current Vatican direction as "ineffective" and problematic. 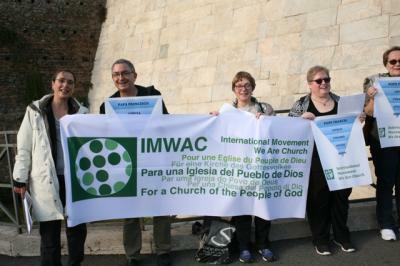 We Are Church International (WACI) founded in Rome in 1996, is a global coalition of national church reform groups. It is committed to the renewal of the Roman Catholic Church based on the Second Vatican Council (1962-1965) and the theological spirit developed from it.